Jean-Pierre Sauvage, Sir Fraser Stoddart and Bernard Feringa will share the 8m kronor (£727,000) prize for the design and synthesis of machines on a molecular scale. The machines conceived by today's laureates are a thousand times thinner than a strand of hair. They could slip inside the human body to deliver drugs from within - for instance, applying pharmaceuticals directly to cancer cells. "They have mastered motion control at the molecular scale," said Olof Ramström, from the Nobel Committee. Reacting to the award, Prof Feringa said: "I don't know what to say, I'm shocked. And my second remark was: 'I'm a bit emotional about it'." Donna Nelson, president of the American Chemical Society (ACS) said she was "thrilled" by the Nobel Committee's decision. "It's wonderful. I've done work in nanoscience for a while - though not in micromachines - so I think I have enough background to appreciate the difficulty of the work they did and its magnificence," she told the BBC News website. The professor of chemistry at the University of Oklahoma added: "I'm also interested in the public perception of science and this topic is perfect for capturing the imagination of schoolchildren." "The world is so aware of the Nobel Prizes and they influence the research. It will make the area blossom; more scientists will move into the area and it will attract more funding. You can expect the applications to appear much more rapidly now." The celebrated physicist Richard Feynman is often credited with inspiring the concept of molecular machines. In a lecture at the California Institute of Technology (Caltech) in 1959, titled "There's plenty of room at the bottom", he considered the possibility of the direct manipulation of matter at the atomic scale. It was also in this lecture that he introduced the idea of "swallowing the surgeon". Jean-Pierre Sauvage was born in 1944 in Paris, France. He is currently emeritus professor at the University of Strasbourg and director of research emeritus at the French National Centre for Scientific Research (CNRS). His work provided early breakthroughs in the area of molecular machines. He had been researching the use of sunlight to drive chemical reactions but this work helped him work out that he could link different molecules together in a chain. 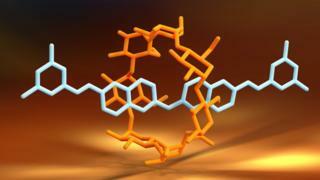 This was the first step towards building molecular machines. In 1994, Prof Sauvage's research group succeeded in making one molecule rotate around the other in a controlled manner when energy was applied. Sir Fraser Stoddart was born in 1942 in Edinburgh, UK. He is currently affiliated to the Northwestern University, in the US. The Briton made a key advance by threading a molecular ring on to a rod-like structure that acted as an axle. Sir Fraser then made use of the ring's freedom to move along the axle. When he added heat, the ring jumped forwards and backwards - like a tiny shuttle. His group later built on this discovery to build numerous molecular machines, including a lift, a muscle and - in partnership with other researchers - a computer chip. "It's a recognition of fundamental chemistry and I think that should be celebrated today," Sir Fraser told the BBC. But he condemned the outcome of the Brexit vote, saying international collaboration had been "absolutely critical" to his successes. "Today I am distressed that the UK is looking at a situation where it would cut off that supply. This is not good news... I would hope that this whole business of Brexit would just go away or had not happened." He said this placed British science "in jeopardy" and said politicians in the current government had "gone off the rails". Bernard Feringa was born in 1951 in Barger-Compascuum, in the Netherlands. He is a professor in organic chemistry at the University of Groningen, the Netherlands. In 1999, Prof Feringa led the first research to produce a molecular motor that continually spins in the same direction. In 2011, his group built a four-wheel-drive nanocar: a molecular chassis holding together four motors that functioned as wheels. Commenting on the award, he said: "I feel a little bit like the Wright Brothers who were flying 100 years ago for the first time and people were saying why do we need a flying machine and now we have a Boeing 747 and an Airbus. 2009 - Discovering the structure and function of our cells' "protein factories", earned the chemistry Nobel for Venkatraman Ramakrishnan, Thomas Steitz and Ada Yonath.